People love their dogs. We try to take Maggie everywhere we can when possible. We aren’t the only ones who love to bring their canine companions along for the trip. Here are a bunch of doggy nomads and their owners you will want to follow. Dexter is a cute Cavalier King Charles Spaniel who loves to travel. Dexter and his owner Tonya give great tips on travel destinations, restaurants, attractions and more throughout the United States. Louie Vuitton is a french bull dog who has a knack for the finer things in the travel life. Louie Vuitton and his mom travel throughout Europe exploring cities and towns together. 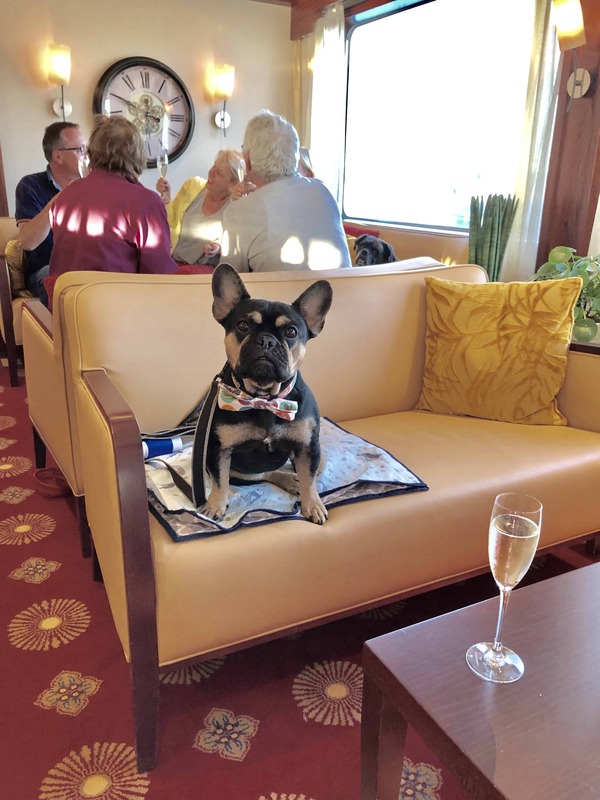 From river cruises to tea time Louie always knows how to dress the part. Schnitzel is a dachshund who love the outdoors and exploring the world around him. Schnitzel and his human Shandos give great tips about flying, hiking and overall explorations of the world with a dog. Chilli is a Yorkie who loves all things involving mom and travel. Chilli and his human Vick explore the world together from air to sea to mountains and give readers an inside look into the world of being a doggy nomad. Hugo and Millie moved halfway around the world with their mom Helene! They are definitely an adorable duo to watch and learn from if you have larger dogs you want to travel with because this duo is giving lessons on how to conquer the world. Babu is a Tibetan spaniel who loves to join his mom on trips to wineries and the beach. Babu and his mom Paroma explore California together like two best friends should leaving no memory left behind. Bailey joins her mom on adventures throughout the United States. Bailey and Leigh love to hike and explore the cities their hearts take them too, giving readers information about the greatest hiking trails and hotels around the area. Atlas was abandoned as a puppy and soon became a viral story via the Dodo. This is where Molly his soon to be mom fell in love. She contacted the shelter that rescued Atlas and a month later Atlas finally got to meet his furever home. You can read about their story on their blog and explore the world as the two become best of friends. What recommendations do you have for doggy nomads to follow? Leave them in the comments and we will be sure to add them! The Portly Passengers provides plus size inclusive travel tips and advice for anyone who is looking to explore the world. From seat sizes on airplanes to exploring museums, restaurants, and nature Melissa & Peter have the experience and stories to help guide you through it. Melissa & Peter are a couple of goofballs who are in love with traveling & each other. You are welcome! Schnitzel is adorable & we can’t wait to read about his next adventure.